Unfortunately, far too many people don’t like where they work. Some organizations are unhealthy and full of disrespectful behavior. Other workplaces are simply uninspiring. For various reasons, countless people feel trapped, indifferent, or bored at work. The authors of this book believe that people should be able to like where they work. When employees like the places they work, it’s not only good for their mental health and well-being, it’s also good for their organizations – both financially and otherwise. When a workplace culture is purposely created to be respectful and inspiring, employees are happier, more productive, and more engaged. Communicating Your Purpose and Values. Employees are inspired when they work in organizations whose purpose and values resonate with them. Providing Meaningful Work. Most employees want to work on projects that inspire them, align with what they are good at, and allow them to grow. Focusing Your Leadership Team on People. How leaders relate to their employees plays a major role in how everyone feels about their workplace. Building Meaningful Relationships. When employees like the people they work with and for, they are more satisfied and more engaged in their work. Creating Peak Performing Teams. People are energized when they work together effectively because teams achieve things that no one person could do on their own. Practicing Constructive Conflict Management. When leaders don’t handle conflict promptly and well, it quickly sours the workplace. This book includes survey feedback from over 2,400 leaders and employees and resources for putting these ideas into action. 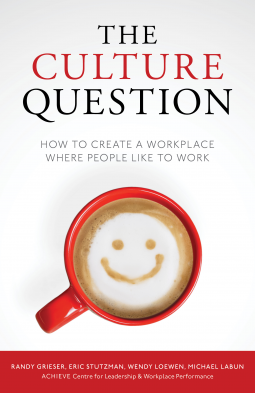 "The Culture Question is an insightful guide for creating a healthy and sustainable culture." "Step one: put down your management theory textbook. Step two: read The Culture Question. Step three: become a better leader."